During the 3th International Workshop on Thermoacoustics held on October 26-27 at the Twente University in the Netherlands, Aster had presented some results of ongoing work on bi-directional turbines and the interface to thermoacoustic engines. efficiency raise with gas density. In addition, emplacement of multiple stages in series is found to be a way to match the turbine circumferential speed to the available acoustic gas velocity and generator parameters. Based on these results a design procedure is in progress allowing to characterize, scale and match bi-directional turbines to any type of thermoacoustic heat engine. 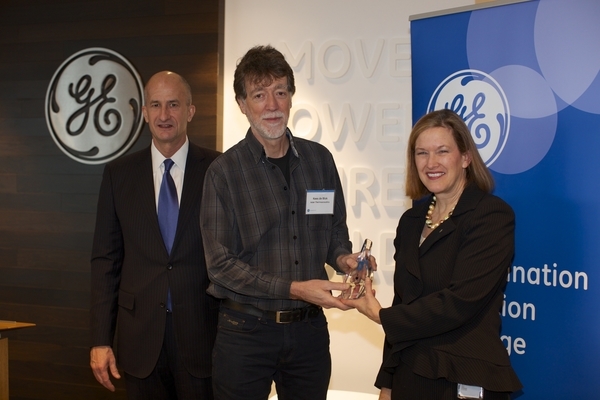 During a ceremony held on February 3th 2015 at the GE innovation Centre in Calgary, Aster Thermoacoustics was announced as one of four winners of the first phase of General Electric’s two phase “Ecomagination Innovation Challenge” with winning submissions addressing alternative uses for waste heat from SAGD (Steam Assisted Gravity Drainage), ultimately reducing greenhouse gas(GHG) emissions in Canadian oil sands. During the ceremony Kees de Blok received the challenge award from Elyse Allan, President and CEO of GE Canada and John Rice, vice chairman of GE. Beside a cash prize of $25,000 Aster Thermoacoustics and the other winners get an offer for another $100,000 in co-development funding to bring their idea’s to application in the oils sands. 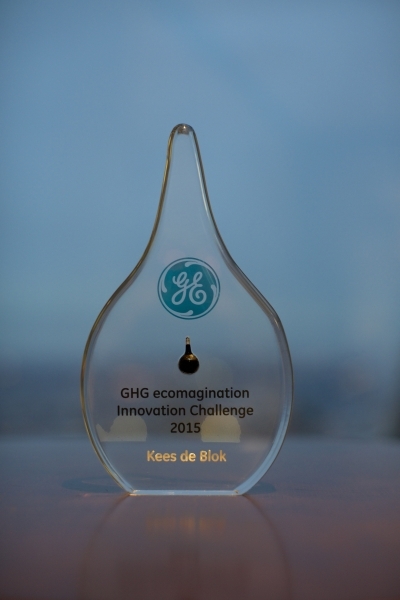 Details and background of the challenge and of the other winners may be found on https://gereports.ca/ghg-ecomagination-innovation-challenge-winners. Bi-directional turbines for the conversion of acoustic power into electricity as they were introduced by Aster early 2012, has turned out be a successful approach both in scaling up in power levels and in reduction of complexity and manufacturing cost. To demonstrate the simplicity of the concept you may have a look at the video below, which shows a small bi-directional turbine plus generator, driven by the periodic acoustic flow from a loudspeaker. What is interesting to see, is that the electric output (light) is hardly dependent of the acoustic frequency. This is an additional benefit of the bi-directional turbine concept because of the oscillation frequency of thermoacoustic engines varies with temperature which in case of resonant linear alternators could lead to detuning and performance degradation. Since the first experiments a lot of progress is made in the understanding, design, modelling and construction(e.g. 3D-printing) of this type of A-E conversion and at present a full scale bi-directional turbine operating in 3.6 MPa helium is under construction to be applied in a 14kWe thermoacoustic power generator. Last year some details and intermediate results on this A-E conversion concept were presented during the 9th International Pamir conference and Summer School, both held on June 16-20,2014 in Riga, Latvia. The paper and presentation may be viewed here.